You will receive attunements to the Master Symbols (Usui and Tibetan symbols) and you will be taught several further healing techniques such as psychic surgery, how to give healing attunements, how to initiate people to the three Reiki degrees. You will also learn how to teach the courses in order for the student to best assimilate the course information and energy work. You will receive a comprehensive manual (also as a disc giving you info on all three degrees - including manuals for I, II and masters as well as certificate forms) with everything you need to go out and teach yourself! The Reiki Master's course will run over three days. Cost for the three-day Reiki Master's Course is £380. There is a link above for Sandra's Reiki lineage. Please ring to arrange dates. Please ring/text Sandra to arrange 07752168159.
then the above mentioned dates, especially the 3rd day can be taught on a week-end. If you can't do any or all three dates above, please ring the Centre on 020 8579 7230 to arrange different dates. I am quite flexible - week-ends and during the week is both fine with me. "Magical 3 days of Reiki Master course. I literally forgot about the whole world (in a positive way off course). "Sandra, I want to thank you from the bottom of my heart for this gift of Reiki. I never expected to feel so light, so unburdened. I feel I am walking on air, on top of the world! The Masters course was a completely magical experience, one I will not forget. The Reiki Masters course is a natural continuation on the path of Reiki but at a much higher frequency. Sandra has the unique ability to teach this course with love, kindness, conpassion, generosity and patience, encouraging Masters-in-Training to be the best that they can be. Sandra also ensures that we are able to teach and attune others into Reiki wth confidence, knowledge and understanding, enabling us to be great teachers and advocates of Reiki. “I'm feeling amazing, people can't believe the difference. I'm so much more chilled and positive. I'm also not taking any more crap from anyone which is fantastic!” Michelle R....she continues her comments..... "Since I’ve become a Reiki Master my life has changed completely and I am so happy for this shift in my awareness. I am able to take true responsibility for myself and I am using my skills every day. Sandra helped me considerably to clear the blocks I had struggled with and I can’t thank her enough for her patience and guidance on my journey. People are commenting on the changes in me every day and I look forward to my future and continued learning as a Reiki Master." Michelle R.
What an incredible three days! Feeling so much more empowered, centred and responsible. Feel the inner child within me which I've ignored for so long is back home safely, held and comforted. So much more aware that I have to be my own mother and father. That no one else can nurture me as well as I can myself. I can do it and live my life. Feel very confident in my abilities now to teach Reiki. What a blessing! More comments from Gina following the course..
"I never expected to shift so much of my own stuff so quickly! A very moving and exiting process, getting more internal and fulfilling over the 3 days. Last day especially amazing. The advice "physician, heal thyself" is very real here. I feel I now have the tools to move forward myself as well as helping others to do the same. Thanks you Sandra, & Thank you Reiki. "We've had a great week, rife with transformation and excitement. Thank you for an amazing Reiki masters course. It was and continues to be a wonderful gift, which I can't wait to share with as many people as possible. I have already invited many of my friends to receive Reki 1 and 2 attunements for free/donation/session swaps which I am looking forward to acting on in the near future. I have also been shown how to move forward dynamically with the manifestation of 'the school' I told you about... Miezan has also manifested more job security this week.I have also started drawing and painting, something which I have not done for a very long time, so the creativity is flowing again, which is really gorgeous. All in all, plenty of joy and a feeling of forward movement. Out of the mud at last! I hope your week has been as blessed. "It has been a wonderful and enlightening three days spent with Sandra and co-student Katherine. I have felt energy cursing through my body, seen the most vibrant colours cascading around me - through the attunements and perhaps most precious of all is the feeling of tranquility of being able to let go and trust that I will be taken care of by a higher energy. Some day I woke up feeling I loved everyone in the universe, and would readily forgive the wrongs of the past. Other days sad feelings surfaced and had to be healed. Just so glad that I am able to heal myself and others who may need it. The path into the future is clear for me, a balance of career and inner self, not making long hours and constantly under stress. I am now free to be a loving human being, a healer and teacher of Reiki. 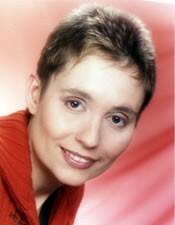 Thank you Sandra for having guided me through the three Reiki stages with loving care. Thank you Reiki for a wonderful healing gift. Mai"
"It seems to be the aftercare that Sandra gives that is so crucial and impacting as I found this quite difficult (and still am). The course was so valulable and I learned a lot more than expected. Teaching by Sandra is totally relevant (materials, class size, subject and relaxation time) and powerful. Even in the sticky bits she helped bring me forward without judgement and helped me on the days of the course in every way since. With my greatest thanks to my friend Sandra, you inspire and uplift me and have helped in a trillion ways. I wish you all the success and happiness and love that you are. Because you are all these things. Magical. "Thank you for a wonderful 3 day Reiki Master course and a big thank you for our healing day together. As you know, a lot of energy has started to shift with me now and I am starting to feel much lighter. Even more so now that I have completed all 3 days of the course. My apetite is resuming bit by bit, but still my body wants to do lots of physical exercise. I am just listening to my body and going with the flow. I feel I am still processing the Master energy, but know that I am feeling lighter and very much at peace with myself. Along with my diet changing, I've not been sleeping too well, but I feel it's my body's way of adjusting towards a lightbeing. Since applying the distant symbol, I've been having lots of dreams about my past ie. school days, childhood home etc, but all very positive. It's difficult to put into words what I am experiencing because what I am feeling is alot of subtle energy and vibrational shifts. The shifts are also affecting me on the physical level, in that my diet has changed and I am no longer able to eat fatty foods and caffeine. In fact, I havn't had a sense of taste/smell with food since I started the course. My body seems to want to exercise all the time, so I have done quite alot of major working out with regards to my training! i'm not complaining, because physical activities are my passion and it's been great to have so much energy to work with. I did a 2 hour workout last week and felt so energised afterwards. I am also finding that I cannot tolerate lower vibration energy in that I get quite impatient with people who offload their problems onto me (there are not that many, but the few that have done so over the past week have irritatated me and I've had to detach myself for the time being. I feel that I am vibrating on a higher level, and know that I have moved on from lower energies). I've also found that my dreamlife has been very strong and I am dreaming alot about my past experience ie. childhood, past relationships etc. I am also aware that I am continually drawing the Master Usui/Tibetan symbols in dreamstate, so alot of work is also going on with my spirit in the astral world. I am enjoying my shift of energy and am feeling very liberated as a lightbeing. Long may it continue! I feel that the psychic surgery that I did with Sandra is still working into my energy system, so past life/past issues in this life will start surfacing. The Master energy is a great tool to work with and I know that I will be o.k. and will have the strength to work through all the challenges that come my way. "This has most definatley been the most powerful experience I have been through and still going through, everything in my body moved, from flu, period, the runs, not feeling ill with it but, everything pouring out, this is also happening emotionally, all thoughts pouring out, I would recommend anyone who is working full time to take a week off between the two weekends. It is a lot to cope with, and I felt that I should have done this to take in everything, and understand what was happening to me. I felt as if I had to take this Friday off, (a whole day for me) and I did and feel much better for it, between the two weekends I was high one minute and low the next, a very mixed week, also so much heat I thought at one stage I would explode, but when I came out on the following Sunday I did feel so much better, overall I feel strong and I feel complete within myself, their somehow doesn't seem to be a need to ask so many questions, and if I do ask the answer is OK, in regards to the course I really did enjoy it, meeting everyone I think we were all meant to meet for some rason, and your teaching is very relaxed but informative, and a pleasure, overall I cannot find anything that you need to change in regards to our group as it just flowed, you are a very talented teacher, and I am sure each class is different and you are well adjusted to suit all needs, once again thank yo for completting a journey for me. Love Helen". "A very rewarding and emotional experience with so many changes. I felt as though a river of light had taken over me in life. I have become much more spiritual and have experienced a complete emotional change also. I find myself being more tolerant with people and becoming more sensitive of people. I feel that my "Third Eye" has opened along with all the sensitivity that comes with it. Felt very alive and very vibrant after the course. I felt I should have taken some time off work to experience all that was happening to me. I find that at work people react differently to me. I presume this is due to different energy levels and changes in personality that have taken place in the last few weeks. I find myself drinking less, a complete change in lifestyle is taking place. Since doing the Masters' course, I feel in some way as though I have progressed from driving a nice saloon car, to a turbo-charged sports variety! The effect on everything has been truly wonderful. Even simple "hands on" is quite a different and deep experience. I give myself an hour's session and find that the energy is literally coursing through my feet and legs and the whole feeling is so amazing I can hardly bring myself to stop! I especially love the psychic surgery, and use every opportunity I can to practice this on anyone I am treating. The colours and lights and energy that accompany this are so fantastic, and there are some wonderful psychic experiences which I have had afterwards as well. I am feeling a very strong pull towards practising Rei-ki on a more serious level myself since having completed the course and have a very strong image of me being able to do this once we can move to Ghana as planned..
" Having been given the Usui Master symbol and having the soul reading from Sandra about an issue of obsession with a certain man - this issue was already 14 years old and I hadn't seen this person for 6 years in person - that night (after 1. day of the masters course) I engineered our meeting and we cleared the problem together for good. Without Sandra pointing out to me the inherent divinity in all human beings, this never would have happened. 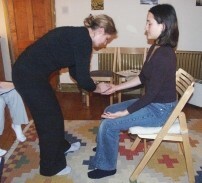 "I have had great fun learning about becoming a Reiki master. It has been a privelege to be able to work one-to-one with Sandra and she has given me the confidence needed to go through the attunements and undertake the responsibilites and opportunities that go with the 'Masters'. I have been warned that the course could be tough going and difficult but this was misleading and totally untrue. Interestingly, I had a 'blockage' which manifested itself in choking. When it came back again, I was able to discuss it with relative ease and I knew that I could do it again. Sandra has been clear, concise and a brilliant teacher. As a teacher myself, I recognize the rare gift of being able to instantly "click" with your student and gauge optimum speed and approach for an enriching learning process to take place. The work I need to have to undertake on myself is not inconsiderable. I will let you know how it goes. Thank you, Sandra. Light and Love Saxon"
"A fantastic three days. I have experienced so much on such a deep level. On the first day, I was feeling spaced out and clear; as if a deep, cleansing process had just taken place. "I found the training came at the right time and in the right way for me. I needed specific attention to detail and also firm, but compassionate, teaching. I felt the pace was just right for the master training.